Michael Ong and Jeremy Tay almost need no introduction—the co-founders of Prestige Global Designs are widely recognised as two of Singapore’s leading interior designers. Their multi-award winning practice is regularly called upon by the rich, famous, and discerning looking for a new interior scheme; at the Tatler Design Awards 2018, the practice received the Best Penthouse Project accolade, in celebration of their canny ability to turn these duplex apartments into realms of style. How Ong and Tay became such prominent industry figures is something of a marvel. Ong is a former cabin crew while Tay, who has a PhD had worked in education. Although neither had planned on becoming interior specialists, the design duo had a winning combination—sharp eye for design, a gentle manner and sheer hard work. It was Ong who came up with Prestige Global Designs, having studied interior design on a whim in London; Tay joined him in 2008. Together, they lean towards a classic European style, favouring intricate wall panelling over bare bricks, while working with traditional tones to create an elegant mood. Little wonder perhaps that they count some of Singapore’s most sophisticated addresses among their past successes. One of their latest projects was a penthouse situated within the Pavilion 11 condominium (pictured above). Tasked with creating a homey atmosphere in an otherwise fairly austere building, they began by taking into consideration the client’s family situation. This family-friendly approach can be found throughout the house, with details such as the step-ups in each of the children’s bathrooms ensuring that the home is actually livable, rather than being just a beautiful showpiece. It is what makes Tay and Ong firm favourites among those who want to retain a stylish lifestyle even with little ones in the picture. As is fitting of their signature aesthetic, Prestige Global Designs frequently works closely with luxury brands to furnish their projects; Hermès, Baccarat and Giorgetti just some of their regular go-tos. Similarly opulent pieces were used in the renovation of a luxury condominium in the Dharmawangsa Residences in Jakarta, Indonesia. The owners of the 3,500sqft abode had opted for a cream and pearly white scheme. To bring the space to life, Tay and Ong injected some eye-catching features including two chandeliers by Saint-Louis, one of the oldest glassmakers in Europe. These chandeliers, along with the Thomas Pheasant-designed furniture, make for an arresting interior that exemplifies what Prestige Global Design aims to do—to make exceptional homes for each one of their clients, surpassing even the original brief. “We seek to exceed the expectations of each of our clients, even if they are already accustomed to the finest things in life,” explains Tay. Occasionally, this may mean surprising the client by either proposing elements that they may not have thought of or even bypassing certain requests. In the case of a recent project at Corals at Keppel Bay, Tay and Ong made the decision to reinterpret the client’s request to use substantial amounts of gold. They also went beyond the brief by proposing that several structural elements be revised, and began by adding a bar to run the length of the reception area. “The client was really pleased with the outcome,” beams Tay. It has also been a resounding success at the International Property Awards 2018, held in May; this project received a total of five accolades this year, for its stunning interiors. 2014: The firm scooped up Best Interior Design Apartment (Singapore) and Best Interior Design Apartment (Asia Pacific) at the International Property Awards (IPA) and came Highly Commended in two categories. 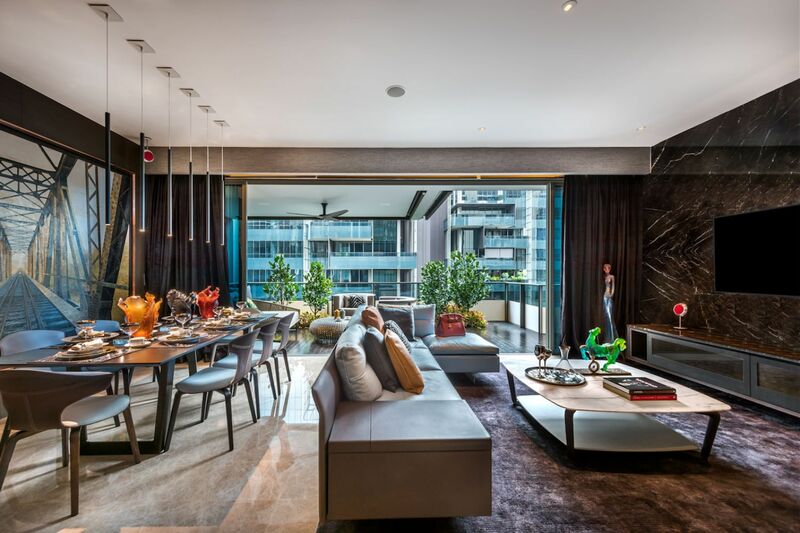 2015: At the IPA, the firm landed an award for a luxury apartment they had furnished, located within the Marina Bay Residences condominium in Singapore. 2016: The practice bagged six IPA awards including Best Office Interior (Singapore) and Best Interior Design Private Residence (Indonesia), and was named one of the top interior design firms in Best of Singapore (BOS) by Singapore Tatler. 2017: The firm made it to the list of classic interior design in Best of Singapore two years in a row. 2018: The practice has its best year yet—it garnered nine awards at the IPA, received the accolade for Best Penthouse Project at the Tatler Design Awards, and is celebrated for its classic interior design in Best of Singapore again.